When we started to pack to move I packed up all of Eliza's room, including the scripture cards. For days she cried asking for her "specials". Mark and I had no clue what she meant, but then one day she said "up there" pointing to where her shelf used to be, "my 'N'". She was asking for her scripture cards back. I am happy to say they are back and I have a happy little girl again. They will be making the trip to the condo with us to be in her temporary room as well. I absolutely love these cards. I love that Eliza learns her ABC's and scripture at the same time! We have given these as gifts and donated a set to our nursery at Church. So lets get to the good stuff! 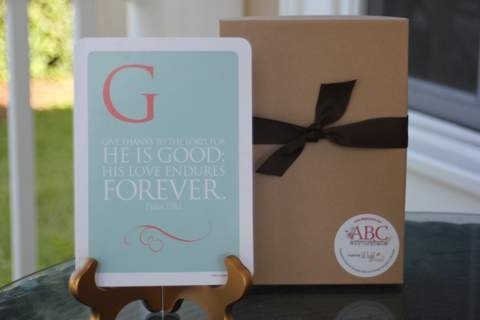 Courtney has so GRACIOUSLY offered a set of ABC Scripture Cards to one of my readers! 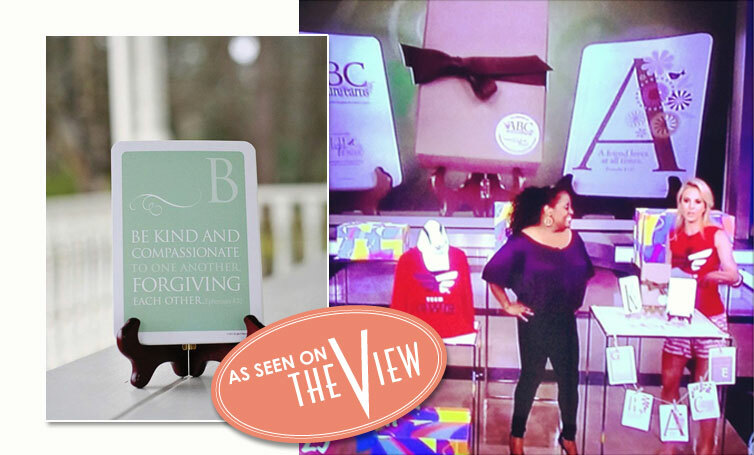 These might even look familiar to some of you, they were recently featured on THE VIEW!! How exciting for Courtney!! You can see the segment here. Just like last week, all you have to do is use Rafflecopter below to enter. You must be a U.S. resident who is 18 years or older to win. I will be contacting the winner following the 6/14/13 close date and the winner will have 24 hours to respond to their email. Lil Light O' Mine will then provide the winner with their set of scripture cards. Kalyn. So happy to do it. Thanks for your sweet words! I love that she wants them in her room again. I am going to finally meet my 11 month old niece and 3 year old nephew for the first time this August and I would love to give these to them. I nanny for a little girl and I would love to give these to her and her family. For my two litte one's! These are encouraging! I'd like these for my little one. Thanks for the giveaway. Our three children would love these! Thank you for the opportunity to win these encouraging and beautiful cards!! I have two little girls and I would love a set of these cards for their room! This is exactly what I have been looking for! My preschooler is showing such a desire to learn verses! I would love to give these to my two little ones who are learning their letters and learning to love Jesus! Thanks for the giveaway! Oh, I've always wanted a set of these. I would love to have these for my two precious great-nieces who are being raised by my godly nephew and his sweet wife. I would give these to my sweet kids for now and pass them on once we are through with them. I keep hearing amazing things about these and would be BLESSED to receive a set! It may be too soon for me to be thinking about this but I have a 3 month old and I would love to get these scripture cards for him. Now I know they wouldn't go to use right away but it is just such a great idea to help him learn that I just can't resist.